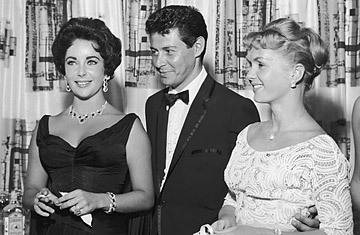 American singer Eddie Fisher smiles and stands with his arm around his wife, American actress Debbie Reynolds, right, while looking at British-born actress Elizabeth Taylor in Las Vegas, Nev. in this 1958 photo. The next year Fisher left Reynolds and married Taylor. Eddie Fisher was the golden boychik of mainstream pop, the dimpled troubadour from Philadelphia. Pretty and poised, he had the packaging and the product: a clear, confident tenor that could turn powerful or intimate at will. In the 1950-54 prerock period  the most tepid five years in the history of 20th century music  he had 19 songs reach the Top 10, including four ("Wish You Were Here," "I'm Walking Behind You," "Oh! My Pa-Pa," "I Need You Now") that went to No. 1. When he was drafted into the Army during the Korean War, President Harry Truman proclaimed him "my favorite PFC." He transferred his vinyl popularity to a TV variety show and then to movies. Fisher's covenant with Hollywood mythology was sealed with his 1955 marriage to Debbie Reynolds, Hollywood's princess of pert. It marked the perfect merger of adorable and adorabler. Show-business legend-making is dreams plus lies. Sometimes the truth slithers out from under the parade float, sometimes not  more frequently now than in that sedate stretch between World War II and Vietnam. Fisher was an agent of one of those shocks to propriety in 1959, when he divorced Reynolds to marry Elizabeth Taylor. Liz could wed early and often (this was her fourth marriage, at 27); the public saw her as a creature of exotic allure and mercurial passions. But Eddie, promoted as the boy next door, was declared a war criminal of domesticity for deserting Debbie's dollhouse. Fisher was the victim of another, larger jolt in 1962, when Taylor left him for her Cleopatra co-star Richard Burton. Biter bit, America thought; serves him right. The one-two punch of infidelity and cuckoldry left an instant, perpetual brand on Fisher's résumé. From platinum recording artist to Johnny Carson punch line, he dwelled in oldies purgatory for nearly 50 years, dying Sept. 22 in Berkeley, Calif., of complications from a hip fracture. He was 82. "By the time I was 33 years old," he proclaimed in his 1999 autobiography Been There, Done That (penned with celebrity ghostwriter David Fisher), "I'd been married to America's sweetheart and America's femme fatale, and both marriages had ended in scandal; I'd been one of the most popular singers in America and had given up my career for love; I had fathered two children and adopted two children and rarely saw any of them; I was addicted to methamphetamines, and I couldn't sleep at night without a huge dose of Librium. And from all this I had learned one very important lesson: There were no rules for me. I could get away with anything so long as that sound came out of my throat." By the 1980s, the drugs were choking the sound; Fisher was often unable to perform. "It was either quit cocaine or quit performing," he says in the book. New paragraph. "So much for my career." Fisher co-starred in two movies: with Reynolds in the 1956 Bundle of Joy, and with Taylor in Butterfield 8 in 1960. His presence, so genial on TV, looked skulking on the big screen, and that wrote finis to his film career. He admitted he was no great shakes as a dramatic performer  except for a few times on the concert stage. His father, now proud of his famous boy, would sit in the front row, gazing up as Eddie sang the Euro-plaint "Oh! My Pa-Pa" ("To me he was so wonderful ..."), and Eddie would look down, seemingly misting up at the sight of the man who had made his family miserable. Now that, Fisher said, was acting. In his memoir, Fisher was incapable of acting the gentleman to his first wife. "I've often been asked what I learned from that marriage," he writes. "That's simple: Don't marry Debbie Reynolds." They had two children, Carrie (the writer and actress) and Todd (who in the 1990s managed Debbie's Las Vegas showplace). He would soon have little time for them. While consoling Taylor over the plane-crash death of her husband, producer Mike Todd, Fisher fell hard for the reigning movie queen. "Sexually she was every man's dream," he recalled. "She had the face of an angel and the morals of a truck driver." Decades after Taylor left him, he says, he still carried the torch with the blue flame. His third marriage, to actress Connie Stevens  "the nicest ex-wife I've ever had"  spawned two daughters, Tricia Leigh and Joely, and ended in the usual rancor. "I wish you good luck, good health and wealth and happiness in your own time on your own terms," Stevens wrote him in a farewell note. "I do not wish you love as you wouldn't know what to do with it." See TIME's top 10 celebrities behaving badly.